The International Joint Commission (IJC) has released a short video that highlights the major climatic events that caused 2017 flooding on Lake Ontario and the St. Lawrence River. The IJC is the binational, independent commission that regulates water levels in Lake Ontario and the St. Lawrence Seaway. This video discusses the board’s decision process for managing outflows and provides a basin-wide explanation of why these decisions occurred. It also explains how the flooding could have been worse if the IJC hadn’t taken the actions they did. The Ohio Power Siting Board has recommended conditional approval of the $126 million, six-turbine wind farm set to be installed 8-10 miles northwest of downtown Cleveland. Construction is tentatively scheduled to begin in 2021, 18 years after the project was initially proposed. If carried out, the project would be the first freshwater wind farm in the nation. The approval does contain some three dozen conditions: one of which is that the company behind the proposal, Lake Erie Energy Development Co. (LEEDCo), develop a bird and bat monitoring plan. The turbines will also be barred from running at night from March 1st to January 1st until the company proves that the turbines are not a threat to migrating birds and bats. Once the initial six turbines are installed, many following the project expect LEEDCo to pursue expanding the operation to over 1,000 additional turbines over time. 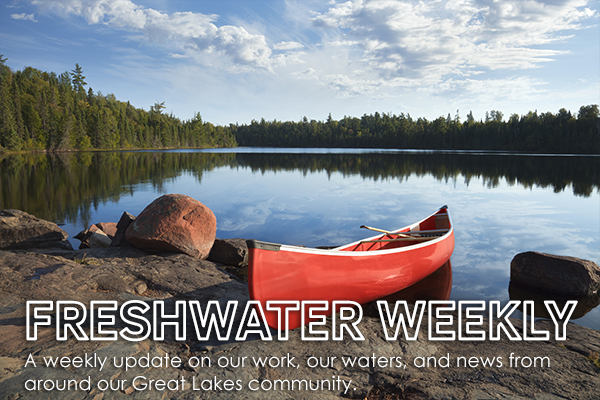 Note: While Freshwater Future supports the expansion of renewable energy in the Great Lakes region, we haven’t yet taken a position on this particular project. Great Lakes Observing System Regional Association in Ann Arbor, Michigan will receive a $585,702 grant to improve early warning systems for Harmful Algal Blooms (HABs) in Lake Erie. The Association brings together organizations involved in the annual monitoring, reporting, and dissemination of harmful algae data. They also communicate with representatives of affected user groups, especially drinking water treatment plant operators. Improvements to the observing system funded by the grant will provide water treatment facilities and their managers with timely and user-friendly access to critical monitoring data during future algal blooms. This will help them make informed decisions about water treatment and management in the face of potentially toxic blooms and help prevent a repeat of Toledo’s 2014 water quality scare. In only a year and a half, Scott Pruitt managed to roll back numerous Obama-era policies. He played a key role in pulling the U.S. from the landmark Paris Climate Accord, initiated the repeal of the Clean Power Plan, suspended the Clean Water Rule, repealed a rule that protected streams from toxic waste disposal, and indicated that he would take down the stricter vehicle emissions standards set to take effect in 2022. Pruitt also presided over an mass exodus of over 700 EPA staff nationwide, the purging of climate change references in EPA websites and documents, and the diminished role of science in decision making. Acting EPA administrator Andrew Wheeler isn’t likely to shift the agency’s course as he steps into his new role. A former coal lobbyist, Wheeler has a long history of advocating for the same types of regulatory rollbacks that Pruitt has championed. Those familiar with his background as a former legislative aide on the Senate Committee on Environment and Public Works and legislative aide to Jim Inhofe (R-Oklahoma)—the most outspoken climate change skeptic in the Senate—say his connections in Washington may help him be even more effective than Pruitt at removing environmental protections. Already, Wheeler has indicated that he will carry out Pruitt’s last agenda item by freezing auto emissions standards and revoking California’s waiver to enforce their own stricter standard. The effect is that automakers will face fleet standards of 35 miles per gallon rather than 50 miles per gallon by 2025. A proposal to build a massive glass plant outside the western border of Guelph, Ontario was rejected by the Guelph-Eramosa Township council in a 4-1 vote this past Monday. Xinyi Glass, the company behind the proposal, said the two-million-square-foot facility would need 1.56 million litres of water per day, an unacceptable amount for many residents in an already stressed watershed. An activist group named GET Concerned collected 1,700 resident signatures on a petition opposing the glass plant and helped organize a turnout of 300 people to the township council meeting. Their argument centered around enforcing a zoning bylaw that dictates industrial development must be “dry use,” meaning it does not use significant water. Ultimately, the Township Council agreed that the project proposal did not comply with that zoning bylaw. Are the Great Lakes Plastic Dumping Grounds? Plastic pollution in the world’s oceans is well-documented. Now, there’s an increased interest in examining plastic in the Great Lakes. Read more. Ohio’s farming industry is worth an estimated $2.4 billion—it’s massive. It’s also the primary source of nutrient pollution in Ohio watersheds emptying into Lake Erie. That’s why Ohio Governor Kasich’s recent announcement is significant. On July 11th, Kasich signed an executive order that aims to place strict restrictions on nutrient pollution that fuels Lake Erie’s algae growth. It’s a result of months of threats that he would act if the legislature did not, stating that the state needed tighter rules to satisfy an agreement to decrease phosphorus in Lake Erie by 40 percent. Given that the Governor bypassed the legislature, we can expect strong pushback and potential delays—or even a policy reversal under the next administration. 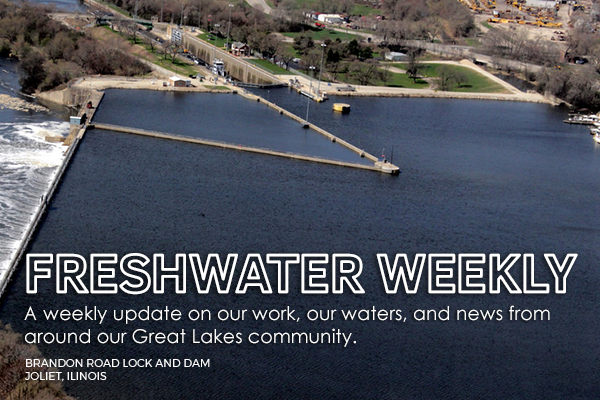 Freshwater Future is enthusiastic about this positive step forward, but we’ll be working to make sure these changes are implemented in a more permanent fashion. The International Joint Commission (IJC)—a bi-national commission that reports to both the U.S. and Canadian governments—released new poll results that show stronger support for the Great Lakes than in its last basin-wide poll in 2015. 4,250 residents across Ohio, Michigan, Illinois, Indiana, Minnesota, New York, Pennsylvania, Wisconsin, and Ontario were randomly sampled by the IJC’s Great Lakes Water Quality Board. Overall, 88 percent believe more should be done to protect the lakes, an uptick of 3 percent. More than half of respondents believe there are too few regulations to protect the lakes, compared with 46 percent in the 2015 poll. Some 55 percent said they are willing to have costs for some consumer products rise to get greater protection of the lakes. Most believe additional rules will either have no impact on the economy or will help improve it. Four of every five respondents agreed citizens have responsibility as individuals to help protect the lakes. Read more. Robert Delaney, a 30-plus year employee at the Michigan Department of Environmental Quality, delivered a 93-page report outlining his concerns about shockingly high PFAS levels in fish and documenting known pollution that indicated “a significant exposure to Michigan citizens and ecosystems.” “Communities with fire training facilities, other Department of Defense (DOD) bases, metal platers, other major airports, major transportation corridors, and other industrialized areas all could have extensive contamination by (PFAS),” Delaney wrote. According to the DEQ, of the 15 recommendations in Delaney’s report, only the proposal for statewide surface water sampling was acted upon before the fall of 2017. Now a national concern—particularly at military bases—PFAS has been detected at 31 sites in 15 Michigan communities. 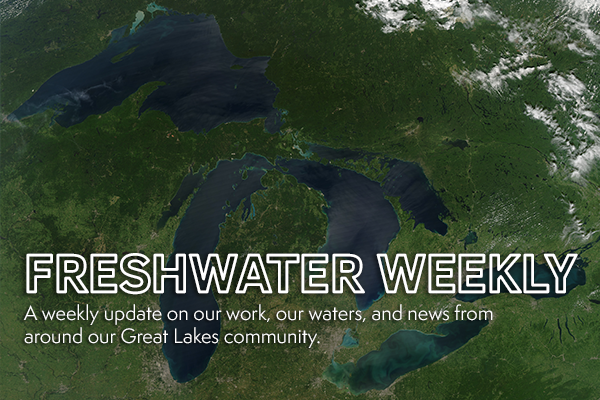 Contamination sites have also been detected in each of the other Great Lakes states. While Michigan is now considered a leader on PFAS contamination response relative to other states, many affected communities are raising questions about the missed opportunity for earlier action. While PFAS have useful commercial and industrial applications, these chemicals also persist in the environment and in people (they do not break down into less harmful forms), and a number of them have been shown to be very toxic even at low levels. Subscribe to our weekly newsletter to stay up-to-date on the latest invasive species news and to receive opportunities to take action. Be sure to share this list with your friends and family in need of a nudge, a reminder, or a back-to-basics invasives education. We know, cleaning your boat or watercraft is a drag. But lace up your Nikes and Just Do It™. Depending on which state or province you live in or are visiting, you might even be legally obligated! Rinse off any vegetation and let completely air dry before launching in a different body of water. This rule applies to your pet pooch as well! Your goldfish or guppy may look cute, small, and innocent, but she doesn’t belong in your backyard North American stream or lake. Goldfish, for example, have been found to grow as long as 16 inches and weigh up to four pounds in the wild. They’re ecological tornadoes that uproot vegetation, disturb sediment, breed excessively, release algae-feeding nutrients, eat everything in sight, AND transmit disease and parasites. Bubbles the goldfish doesn’t look so innocent anymore, does she? Many marine invasions have been traced back to releases of aquarium pets into the wild. If you can no longer care for your aquatic pets, find a trusted friend, family member, or to accept the responsibility. Never (and we *mean* never) release pets into the wild. The health of waterways often depends on the health of surrounding terrestrial environments. Changes in forest composition and shoreline flora can have tremendous impacts on water. Firewood can contain parasites and bugs like the emerald ash borer, Asian longhorned beetle, and European gypsy moth that can decimate North American forests. We all enjoy a good bonfire, but don’t be *that* person—source firewood locally when you travel. 4. Go Fishing (With Native Bait)! 69 out of 180 aquatic invasive species in the Great Lakes region are fish. One primary mode of entry is the improper use and disposal of fishing bait. Use native species if you decide on live bait. Oh, and never dump unused bait into the water after you’ve packed up your rod and boonie hat. Dirt isn’t the only thing you can carry from place to place. The moment you brush past a plant or set your pack in a meadow, you’re inviting seeds to cling to your belongings. Brush and clean your gear to prevent spreading seeds, spores, plants, and insects. Research invasive species in your neck of the woods, travel to your favorite water body, document any invasive plants, and report them! Many states, local governments, and community organizations have online resources to help. Check out this site by the State of Michigan as an example. Invasive species should be reported using the Midwest Invasive Species Information Network (MISIN) online reporting tool or the MISIN smartphone app. Alternately, these species can be reported to the Cooperative Invasive Species Management Area for your region or your local conservation district. Leave plants, seeds, and fruits behind. Basically the same as #6 on this list, but formally through a local community group. Join an existing one, or form your own! This is a great way to reach and involve more folks in your community and democratize the preservation of your local waterways. Community groups can provide training, formal reporting processes, and safe invasive species removal. Before you head to the local nursery, figure out some basic information on your backyard. Soil type? Average precipitation? Sun exposure? Drainage pattern? Slope? Figure out in which “ecoregion” you reside using this USDA Forest Service map. Check your “plant hardiness zone.” Provide this information to nursery staff when you arrive, or utilize it when researching on your own. Your local library, government websites, and non-profit/NGO sources are great places to start. Native species have the benefit of being adapted to environmental conditions of your area. Say goodbye to the days of excessive watering, fertilization, pesticide application, mowing, and pruning! Native plants and alternative, native-plant yards are as close to maintenance free as you can get. As a bonus, you’ll help preserve local pollinators, beneficial insects, birds, small mammals, and other wildlife. All of these benefits have positive spillover effects on your local waterways. We live in a society that cares a lot about what individuals should do, so much so that we often forget to talk about what individuals can do together. Politics isn’t a dirty word; it’s a way of negotiating how things are done in society. Preventing the tremendous disruption human activity often brings to our Great Lakes ecosystems requires personal habits to change AND collective political action. Call your legislators at the local, state, and federal levels; tell them you care about preventing invasive species. Visit office hours of elected officials. Get involved with local prevention groups. Contribute to advocacy organizations working every day to maintain the integrity of our native ecosystems. The Conservatives garnered 41% of the vote, winning 76 of 124 seats in the province. Andrea Horwath’s New Democrats will form the official opposition with 40 seats, while Kathleen Wynne’s Liberals lost official party status with only 7 seats. In a first, the Green Party also secured their first-ever seat with leader Mike Schreiner winning in Guelph. Final results are still pending. Freshwater Future Canada will work with the new government where we can on freshwater priorities, and we applaud every Ontarian who made their voice heard in yesterday’s election. The Water Resources Development Act passed the U.S. House of Representatives by a 408 to 2 margin. It contained an amendment authored by Rep. Dave Joyce (R-OH 14) that would require the Army Corps of Engineers to produce its final report in February 2019, rather than the delayed date announced by the Corps. The initial study recommended building multiple structural impediments near the Brandon Road Lock and Dam in Illinois to keep several voracious asian carp species from escaping the Mississippi River system into the Great Lakes. The $275 million set of renovations has enthusiastic support from several Great Lakes states, who have offered to share in the cost of construction. Most experts agree that the Brandon Road Lock and Dam is the most likely point of entry for asian carp species, and activists and groups—including Freshwater Future—support swift and immediate action to reduce the risk of transfer. On Monday, the Michigan Department of Environmental Quality (DEQ) announced that it has issued a wetlands permit—the final permit needed—for the Aquila Resources Back Forty mining project in the Upper Peninsula. The DEQ had previously issued mining, air, and surface water discharge permits for the project. This final permit was awarded despite objection from the DEQ’s own Water Resources staff. According to the agency’s “Findings of Fact,” the Water Resources Division states that Aquila’s permit application and materials did NOT demonstrate that the project could avoid “an unacceptable disruption” to aquatic resources and that the project is inconsistent with the permitting criteria. Furthermore, the DEQ awarded the permit without fully addressing the EPA-authored objection letter sent by federal agencies charged with enforcing the Clean Water Act. According to the DEQ, the wetland permit is awarded “conditionally” and requires the “submission and approval” of additional data and information, including “revised hydrologic modeling, an adaptive management plan, a comprehensive monitoring plan, and requisite wetland and stream mitigation.” Under the Clean Water Act, this information must be provided before a permit may be granted. Local environmental groups Front 40 and Mining Action Group (MAG) of the Upper Peninsula Environmental Coalition (UPEC)—both Freshwater Future members and grant recipients—were instrumental in exposing gaps and flaws in the project’s permit applications. Check out their take on the DEQ’s decision here. While Michigan law limited the the impact of their work, their persistence and expertise have lessened the risk of this mine and given the public valuable oversight opportunities as the project moves forward. Freshwater Future is proud to have funded and supported the work of Front 40 and the Mining Action Group. Summer weather has descended upon the Great Lakes and with it millions of residents and tourists—boats, kayaks, paddle boards, and swimsuits in tow. With all that movement comes an increased risk for spreading nuisance invasive species like Asian carp, eurasian milfoil, emerald ash borer, and non-native cattails. Check out our newest blog post on the best ways YOU can prevent the spread of invasive species this summer. There are lots of simple ways to help protect our waters. Find more at freshwaterfuture.org/take-action. A recent poll shows that 64% of eligible Ontario voters support phasing out bottled water extraction entirely within 10 years. 52% of those respondents support an even faster timeline of 2 years. The top listed concerns are excessive waste from plastic bottles, the treatment of water as a commodity, the negative environmental impact of water withdrawals, and the reinforcement of the perception that tap water is unsafe. The current Ontario government instituted a moratorium of new extraction permits, for the stated purpose of better researching the combined effects of extraction, climate change, and population growth on groundwater supplies. It is unknown at this time if the moratorium will be extended. A key U.S. Senate committee last week approved a “must-pass” water resources bill that authorizes funding for the Great Lakes Coastal Resiliency Study, which aims to examine infrastructure improvements that might be necessary to prevent flooding all through the Great Lakes basin. Senators from New York, including Senate Minority Leader Chuck Schumer, committed to working with the Army Corps of Engineers to set aside the funding needed for completion. The study is in response to the widespread coastal flooding that occured on Lake Ontario, the St. Lawrence Seaway, and to a lesser degree, Lake Erie last year. Hundreds of millions of dollars in damage occured in New York, Ontario, and Quebec. Provincial disaster relief and insurance claims are expected to tally up to more than half-a-billion dollars in Quebec alone. Water levels in these waterways are influenced by a mixture of precipitation, tributary inflows, ice cover, snowmelt, and how much water is allowed to pass through the Moses-Saunders Dam in Massena, New York. Canada and the United States created the independently-run International Joint Commission (IJC) in part to control water flow from the dam. Many, especially in the United States, blame the IJC and a new set of rules called Plan 2014 for last year’s record flooding. But regulating water levels is a delicate balance: counteracting high water levels in one place can lead to flooding in others. Every centimeter of water released from Lake Ontario pushes the St. Lawrence River 10 centimeters higher, which means the interests of Canadians and Americans are pitted against one another. Proponents of the U.S. study hope it will provide a path forward to protecting against future flooding and high water levels, while allowing for the natural water-level variation necessary for healthy ecosystems. The Midwest Environmental Advocates (MEA)—representing Milwaukee Riverkeeper, League of Women Voters of Wisconsin, River Alliance of Wisconsin, and Minnesota Center for Environmental Advocacy—have filed a legal action to halt a Lake Michigan water diversion for the proposed Foxconn factory in Racine County, Wisconsin. According to MEA, the “Wisconsin [Department of Natural Resources] disregarded and unreasonably interpreted a core Compact requirement that all water transferred out of the Great Lakes Basin must be used for public water supply purposes, clearly defined as ‘serving a group of largely residential customers.’” As the diversion application was written, submitted, and approved, the City of Racine identified a total of 0 gallons to be used to supply residential customers. Of the total 7 million gallons/day, 5.8 will go directly to Foxconn’s main facility while the remaining 1.2 will supply surrounding industrial and commercial facilities. Freshwater Future agrees with the argument set forth by MEA attorneys. We believe the Wisconsin DNR’s decision sets a dangerous precedent that could open up Great Lakes withdrawals to uses beyond the intent of the Great Lakes Compact, and we’ll continue to support challenges to the diversion.